A Master Horse Breeders' Guild notably improves the quality of cavalry units recruited in the region. 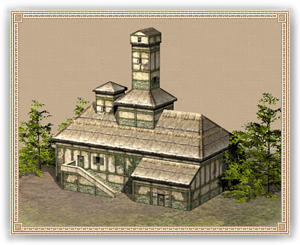 The Horse Breeders' Guild Headquarters greatly improves the quality of cavalry units recruited in the region. The medieval age has made it apparent that the mounted warrior is the most powerful and capable on the battlefield, and thus, the art of breeding steeds that are both strong and fearless has been heavily refined in the recent past. A Horse Breeders' Guild house ensures that the local stock is devoid of skittish nervousness, which has a habit of making cavalry trained here more reliable in battle.